stringasfactor = F changes the output of pheatmap, why? Question: stringasfactor = F changes the output of pheatmap, why? I have a quick question that I cannot seem to work out why it is happening. I cannot figure out why this is happening so any and all ideas and suggestions would be fantastic. I have attached the code I am using to make the heatmap (this is the same for both heat-maps, only stringasfactor changes). Answer: stringasfactor = F changes the output of pheatmap, why? You would have to provide some self-contained code to show what you say is happening. To me it looks like in the first heatmap you used Edit cluster_cols = TRUE and in the second heatmap you used Edit cluster_cols = FALSE. Whether or not you use stringsAsFactors = TRUE or FALSE should be irrelevant, as the clustering is based on your data, which are numeric, so R won't by definition convert to factors anyway. 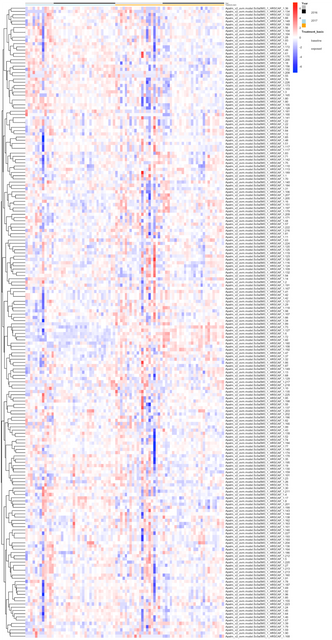 I am sorry if it was not clear, the code for the two heat-maps is exactly the same. As I shared above, the code for the heatmaps is again below, and it is ordered so it produces the first heatmap, then the second as in my original post. Note the only difference being the stringasfactors argument which is the first line. 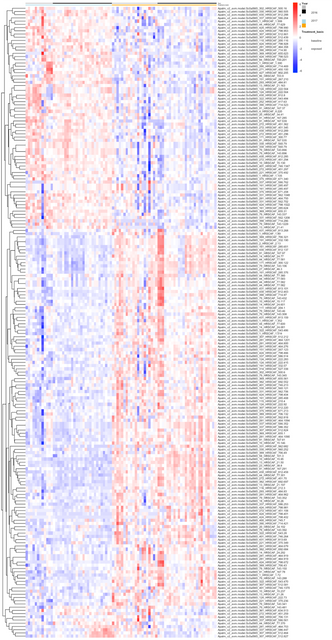 The only thing I changed was a prior stringasfactor = T or stringasfactor = F. For making both heatmaps cluster_cols = FALSE, I supply an ordering of my samples (in the columns) as I want it. It's not whether or not the code is clear. That's not what I meant by self-contained code. By that I mean some code that anybody could run that shows the problems you are having. You are showing some code that you purport will cause changes in the behavior of pheatmap, but nobody else can run your code, so nobody can confirm that they see the same results. I get identical results each time. Perhaps you can generate some self-contained code that shows what you see? First of all I apologise, i blanked on the self-contained code part and it now makes sense. I will try and make this work now (i.e. some reproducible code). Looking a little bit deeper into what you suggested I think this is what is causing the problem. I am working on getting some reproducible code so people can run the code.